CS-Cart Banner Booking : Now allow anyone to advertise on your CS-Cart or Multi-Vendor store with this splendid add-on CS-Cart Banner Booking. Whoever wishes to display an advertising banner on your store can pay for a specific time period and add the desired banners on the website. Admin can create two different types of ads with Text Banner and Graphics Banner accordingly set the price. 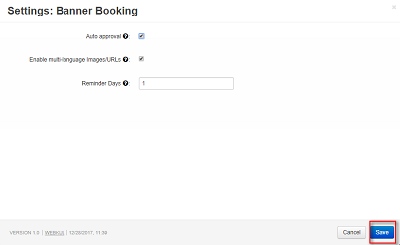 Admin can add numerous ads for booking & make them available for the visitors. Functionality to add redirecting URLs to the banners makes the advertisement more effective. CS-Cart Banner Booking:Now allow anyone to advertise on your CS-Cart or Multi-Vendor store with this splendid add-on CS-Cart Banner Booking. Whoever wishes to display an advertising banner on your store can pay for a specific time period and add the desired banners on the website. Admin can create two different types of ads with Text Banner and Graphics Banner accordingly set the price. Admin can add numerous ads for booking & make them available for the visitors. Functionality to add redirecting URLs to the banners makes the advertisement more effective. Works well with new email template. Email Notifications to admin/buyer for every add, edit, update, expiry, reminder, and delete the advertisement. Easy to use and maintain at admin end. After the successful installation, the admin need to configure the add-on for the proper work flow. If Auto-approval options are checked then buyer doesn't require admin approval to buy and update the booking banners. Reminder Days are the numbers of days to notify buyer for ads banner before expiration. Now every visitor can pay and display the banners on your CS-Cart Store and advertise anything for marketing purpose. The feature to add the redirecting URL along with the banner adds charm to the marketing campaign. Admin can approve and disapprove the banners uploaded or updated by the visitor on your site. The approved banners will be displayed on storefront as per the layout settings made at admin end. Did you buy CS-Cart Banner Booking?